[Somebody Has to Cry] Marilyn Bobes (1955) Awarded the Premio Casa de las Américas, the short stories that comprise this volume, with subtle yet implacable depth, delve into the psychology of its characters: women immersed in the conflicts, doubts and frustrations of a society headed towards the upsetting material and spiritual changes that defined the close of the 20th century in Cuba. [The King of Havana] Pedro Juan Gutiérrez (1950) Described in Europe as a “tropical Bukowski,” this was the first novel by Gutiérrez, who had already successfully published his Trilogía sucia de La Habana (Dirty Havana Trilogy), a collection of three storybooks that share common characters and situations, unprejudiced views and a language bordering on the obscene, which have made him a controversial writer. This work, which the author considers “a study on human cruelty.” he again submerges himself into a marginal world of unbridled sexuality and hopeless characters that he would continue in his subsequent novels: Animal tropical, El insaciable hombre araña and Carne de perro, which are also part of his “Havana Cycle.” Without any advertising, Union Press of the National Union of Writers and Artists of Cuba, published El Rey de La Habana in 2009. The novel was eagerly purchased by Cuban readers, who only had seen published in Cuba other less famous titles by Gutiérrez. [Flight of the Cat] Abel Prieto (1950) The lives, sometimes convergent, sometimes divergent, of three high school friends become the thread of this novel, which, through a gallery of characters and situations ranging from the hilarious to the tragic, explores Cuba’s rich and contradictory reality of the 1960s and 70s. [Secret Inventory of Havana] Abilio Estévez (1954) The contrast between the heartrending attachment of the Havana-born, 19th century poet Julián del Casal to his city, whom he loved beyond its misery and mediocrity, and the never achieved literary utopia of his contemporary José Martí, also born in Havana but cut off from it since his youth, gives rise to the novel in which the city of Havana is the main character, either through the sometimes nostalgic, sometimes unforgiving view of its author, as well as of other Cuban and international writers and anonymous inhabitants. A mixture of reality and fiction, it explores the city, mythicized by yearning and memories, but is also evoked in the harshness of its more somber aspects. [The Mist of the Past] Leonardo Padura (1955) Ex-detective Mario Conde, the hero of four earlier successful novels, who has become a bookseller due to the difficult economic situation in Cuba, driven by the need to prove his innocence in a crime in which he seems to be implicated, digs into the nightclub scene of the 1950s and in the hallucinating world of delinquency of present-day Havana. [The Road to the Sea or We Cubans] Guillermo Rodríguez Rivera (1943) A collection of essays in which the poet and professor Guillermo Rodríguez Rivera, with the carefree and humoristic style of colloquialism, delves into significant aspects of the formation of Cuba’s national identity, either through the vicissitudes of history or that which is both perceived and reaffirmed in poetry or music. A substantial, enjoyable and brave text, which is required reading for whoever wishes to get to know the Cuban people, the elements that have been crucial in the formation of our idiosyncrasy and the motives of certain behaviors, which, for an unsuspecting observer, may seem inexplicable. [Voices and Echoes] Aida Bahr (1958) The dogmatism, lack of understanding and marginalization that marred the Cuban cultural world in the 1970s during the period that scholars have called the “grey quinquennium”—or even decade—is the topic of this novel written in the first-person about the intellectual, emotional and human development of a young woman with a strong artistic vocation, who tells her own story and at the same time ironically questions the aesthetic and stylistic efficiency of her own narrative. A well-known storyteller, the author makes her debut as a novelist with this work, which has been very well received by the public and the critics. [From the White Lunatic Asylums] Margarita Mateo Palmer (1950) This first novel written by Margarita Mateo, who had already revolutionized critical studies in Cuba with her Ella escribía proscrítica, resorts to a crazy character to build a novel “in which…the avid reader will find routes to a magical and mestizo world that will take them by the hand through areas where poetry and fantasies converge. The probable origin of this novel supports quite a few readings in the Latin American and Caribbean context…readings that far from cut out its profile, amplifies it,” as pointed out by the critic Eugenio Marrón. [The Coral Bridge] Hugo Luis Sánchez et in a Cuban coastal village, from the 1930s to 1950s, this novel–a mix between adventure stories and spy fiction–of a marked cinematic nature, strong characters and language that may go from conciseness to poetry, according to the author, “tells the story of three friends, two boys and one girl…It combines love, murder, smuggling and vengeance. There’s a brothel and a whole lot of whores. I began [to work on the book] attracted by the presence of German submarines in Cuban territorial waters during WWII, something that is truly fascinating.” The author breaks away from the vocation of documenting the present, so frequent in today’s Cuban narrative. [The Man who Loved Dogs] Leonardo Padura (1955) The origin of this fascinating novel, which delves into the life and personality of Catalan Ramón Mercader, the man who was appointed by the Stalinist regime to assassinate the Russian revolutionary Leon Trotsky in 1940, lies perhaps in Leonardo Padura’s visit to Trotsky’s home in Coyacá, Mexico in 1989. With a plot set in Russia, Turkey, France, Norway, United States, Mexico and Cuba–where Mercader lived in hiding from 1974 until his death in 1978–the novel, written in Padura’s usual narrative skill, is also an acute reflection on the corruption of socialist utopia in the Soviet Union. [The Loneliness of Time] Alberto Guerra Naranjo (1963) Inserted within a frequent trend in Cuba’s most recent literature–narratives with a strong autobiographical mark and an inclination towards social criticism in which it is very difficult to separate reality from fiction–Guerra Naranjo’s first novel goes into great detail about opportunism and the lack of scruple, which have come to the surface due to the country’s economic difficulties, in Cuban society, and, especially, within the “learned city” in which three writers–the book’s main characters–strive for recognition, which only one of them will enjoy, regardless of how reprehensible the ways to reach their goal may be. [They’re not so Elegant in Havana] Jorge Ángel Pérez (1963) The scenario of an impoverished tenement building in Old Havana, and fire—destroyer and purifier—serve as a thread to the eight stories in which the author, who becomes the protagonist of one of them, tells about the sadness that surrounds the lives of some characters who seek some kind of success at all costs, and end up mired in despair and hopelessness. On the borderline between what has been called neo-baroque and dirty realism, the well concocted stories in this volume expose a Havana that is very far from the tourist postcard and the triumphalist discourse. [Bleeding from the Wound] Mirta Yáñez (1947) Emerging as the voice of a generation that undertook the task of consolidating the Cuban Revolution through enthusiasm, renunciations and many sorrows, Mirta Yáñez dives into the psychology and ethics of her characters, to delve into the imprint left by the experiences of a turbulent and complex time (the tired and old 1960s), seen from the grim prospect of the 90s, which marks the critical, and often harsh, disenchanted view. A master of the narrative technique, of the multiplicity of views and the outline of characters without losing the humor and irony inherent to the author, Sangra por la herida is a lucid and stark review of an era. [Praise to Marshmallows or The Paradoxes of Racialism] Zuleica Romay Guerra (1958) The essay critically explores the history of racism and racial discrimination in Cuba. The test runs, with a critical eye, the history of racism and racial discrimination in Cuba. Appealing to testimony, autobiographical references, historical inquiry and sociological analysis, the author reveals that even though the legal basis for racial discrimination were dynamited by the Revolution, its economic and psychological consequences still survive, and even surface, in circumstances that cause new inequalities. [‘71. Anatomy of a Crisis] Jorge Fornet (1963) Although its title might suggest that the book is limited to one year, 1971, this excellent essay is a thorough, documented and at times delightful study of a crucial process for Cuban cultural policy. The author delves into the background, development, protagonists, antagonists and implications of what is known as the “gray quinquennium,” and from an amazing multiplicity of sources, explores all possible issues that marked it, outlines lessons for the present and leaves room for several controversies. [The Big Wheel] Ahmel Echevarría (1974) The so-called “gray-quinquennium” (1971-1976), which in recent years has been studied from various angles and positions, is the time frame of this novel that revolves around a writer in his sixties who has been excluded from the Cuban publishing scene because of his homosexual orientation. His conflicts, traumas, anguishes and fears; his clandestine relationship with an of the Cuban Security agent; and, no less important, the role of the writer and writing itself, are dealt with masterfully in a complex structure that is accessible to all kinds of readers thanks to author’s mastery of style. January 2015 This article formed part of the January 2015 issue of What’s On Havana The definitive monthly travel & culture guide to Havana Download our current issue of What’s On Havana, your definitive travel, culture and entertainment guide for all things happening in Havana, Cuba’s bustling and enigmatic capital city. 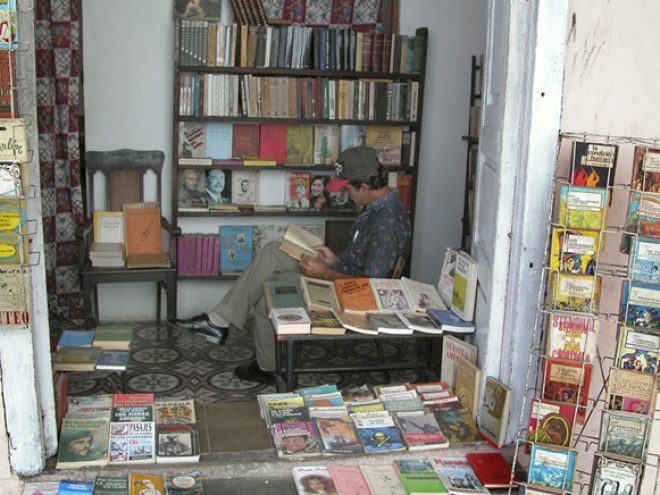 We include features from around Cuba written by the best international travel writers covering Cuba. Our monthly online digital magazine is also available in Spanish and French.